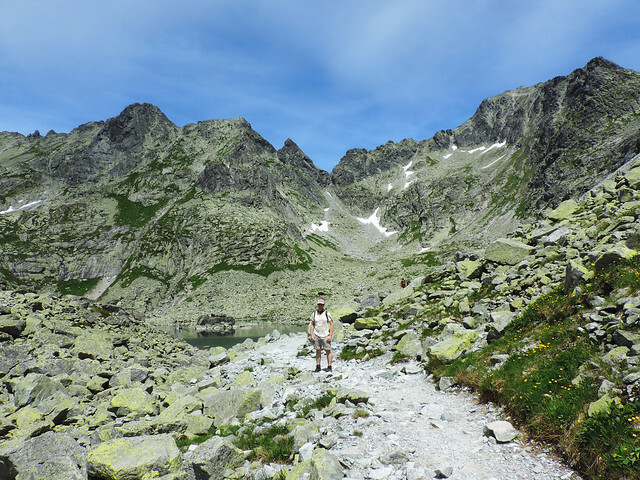 Slovakia’s High Tatras offer great panoramas and great challenges. After climbing to Kriváň (2495 m) we felt it’s time to conquer the highest peak possible. Though the highest point of the High Tatras (and Slovakia) is Gerlach Peak (Gerlachovský štít, 2655 m) there’s no marked trail to it and you are not even allowed to climb it on your own without a mountain guide. So our next challenge was Rysy which is the highest peak that is accessible to individual hikers. We started at Štrbské pleso on the Slovak side – yepp, again. 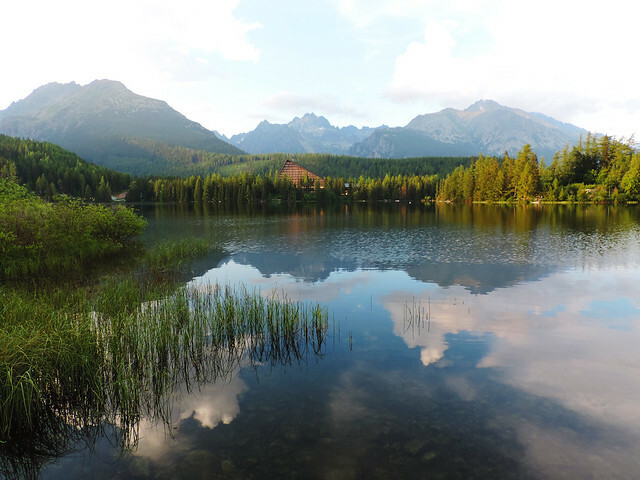 If you want to find beautiful hikes in the High Tatras you can’t go wrong by starting at Štrbské pleso, this easily accessible and pretty lake. And a fabulous spot to have breakfast with peak views. The route to Rysy actually starts from Popradské pleso so we had to hike there first. I don’t think it’s accessible by car, at least not to visitors. But the hike from Štrbské pleso to Popradské pleso is nice and easy and it takes about 1-1.5 hours. Popradské pleso is surrounded by high peaks and there’s a lot of trails starting there to different directions. It’s not yet the remote wilderness because Popradské pleso is always busy. But the easy loop trail around the lake is lovely! There’s also a restaurant and a hotel by the lake so you can even have a warm lunch if you want. We’ve already done the loop around the lake previously so when we aimed for Rysy we decided to only have a short rest stop at Popradské pleso. It was a good decision because the route to Rysy is long and tiring. We wanted to do it in one day which is absolutely possible but we had to track the time carefully and not take too long rest stops. From Popradské pleso we continued on the blue route in Mengusovská Valley (the same route which takes you to Veľké Hincovo pleso, the deepest alpine lake of the Tatras) but soon we arrived to the fork where signs indicate the start of the red route towards Rysy. Mengusovská Valley is beautiful and abundant with colorful wildflowers through the summer! But the panorama got even more stunning as we climbed above the valley towards Rysy. Then we reached the twin lakes of Veľké Žabie and Malé Žabie pleso. From there the trail got really steep. 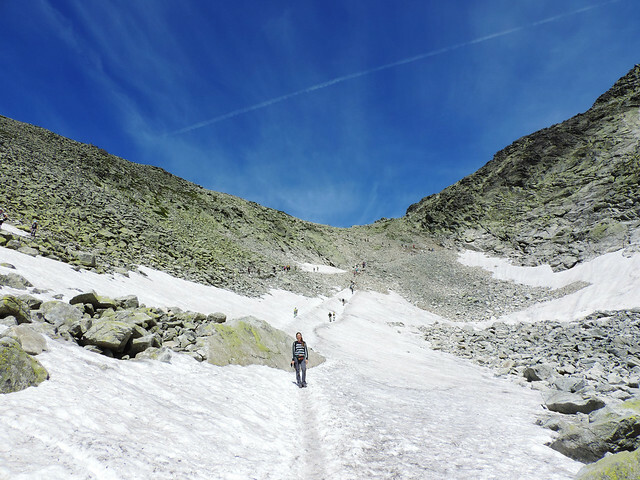 Some sections are secured by chains and we even hiked in the melting snow sometimes – in the middle of July! But the views are worth all the effort. And honestly we don’t think this trail was harder or more dangerous than the one leading to Kriváň – without chains. Anyway, it’s never bad to have chains to hold onto. Rysy actually has 3 peaks and from the Slovak side we hiked through all to get to the highest one. That wow feeling rushed through us all the way as new parts of the landscape appeared. The view from the last 2503 meters high peak was the icing on the cake! We got breathtaking views of both the Slovak and Polish Tatras and several deep blue alpine lakes below us. Summer is the hiking season in the High Tatras anyway and most trails are open from the 15th of June to the end of October. But to make things a bit more complicated thunderstorms are also common in the summer. We recommend you to check weather forecast very often and only attempt to climb to high peaks in clear weather. 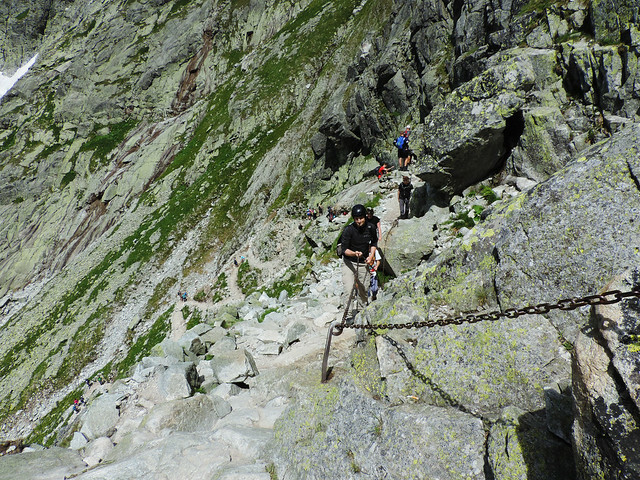 The hike to Rysy is very dangerous if weather conditions are bad! You can find accommodation in the small town of Strbské Pleso (right by the lake), but Poprad is also not far (half an hour drive from Strbské pleso). Poprad is a bigger city so if there’s no available rooms in Strbské Pleso – which can easily happen in high season – you are still good to find something in Poprad. 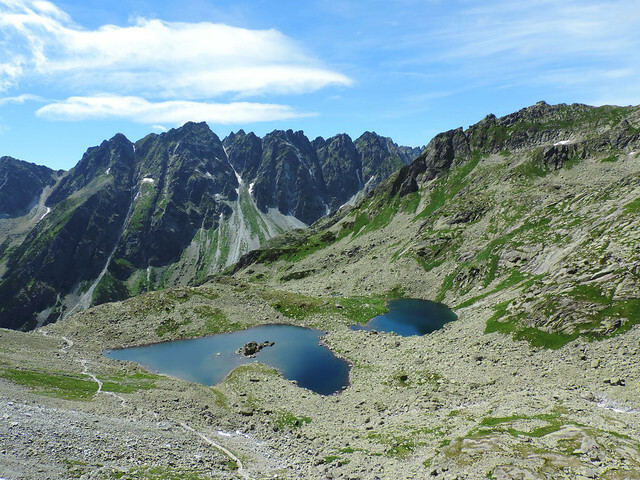 This post is part of a series about our favorite day hikes in Slovakia’s High Tatras National Park – check them out here! What is the highest peak you’ve conquered? And your favorite panorama? 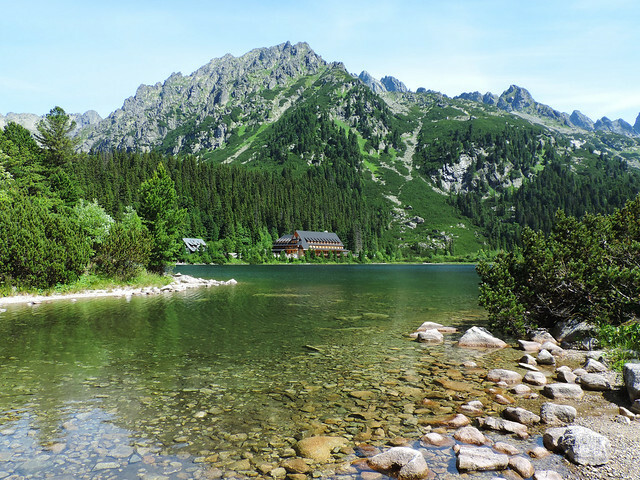 Hike To The Green Lake Of High Tatras!